The internet and children’s use of technology is constantly evolving and for parents and carers, this opens up a whole new world of things to be aware of. In the ever growing digital world we live in it is essential that not only do we keep our children safe outdoors, but also that we keep them safe indoors, especially when on the internet. T – Talk to your parents so that you can agree rules for going online. Decide the times of day and length of time you can be online. Make sure you know which sites you are allowed to visit and keep to the rules, especially with social networking sites that have age restrictions. H – Hoaxers are everywhere! Remember, not everyone tells the truth. Some people may tell lies about who they are. I – If you feel uncomfortable with any website or message, leave right away and tell your parent or carer as soon as you can. Don’t answer any message that makes you feel uncomfortable. Remember, it’s not your fault if you get a message like that. It is also important that you tell someone if you feel another child is bullying you over the internet or doing things that you know are wrong. N – NEVER agree to meet anyone you have met online! K – Keep your personal details secret. Never tell anyone online your full name, address, phone number or passwords. Unfortunately we are not always able to be involved in incidents that occur outside school, however we would encourage you to let us know of anything so that we can offer some advice and ensure that nothing spills over into school. A copy of the school’s e-safety policy can be requested from the school office. 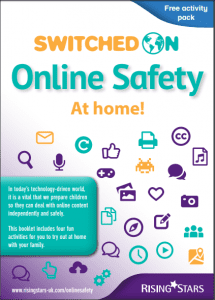 On this page, you will find a selection of resources to help guide you in reinforcing messages with your child about staying safe online. 6 apps and services that every parent should know about.